This post is dedicated to my friend Rachel. Just weeks ago she was diagnosed with Stage 4 Hodgkin Lymphoma and started chemo almost immediately. She has many months of chemo left but she is a trooper! She continues to have such a positive outlook with the help of many supportive friends and family. Rachel's optimism should be shared with other cancer patients, and it's certainly an inspiration to me. I have been looking for days for a recipe that I could rename after her, but it wasn't until this morning that I found something that truly screamed Rachel. Peanut Butter Ganache Bars are the thing I've been looking for. And from this moment on, let's just refer to them as The Rachel Bar. One final note: In Rachel's honor, I will be running (well, more accurately jogging, walking, and panting) in the Carlsbad Half-Marathon on January 25 as part of Team Rachey. 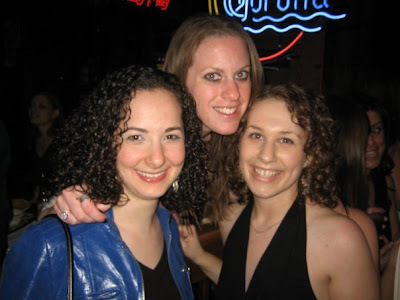 My friend Avi created a fundraising page so we can all contribute to the Leukemia & Lymphoma Society in Rachel's name. If you have $5 (or more, of course! ), it would mean so much if you added to the fund and gave Rachel an even more gigantic support network. I hope you enjoy The Rachel Bar. It was selected and named with love to Rachel. In a bowl, sieve together flour, baking soda, and salt. In an electric mixer fitted with the paddle attachment, cream the butter and the peanut butter until well combined. Add the vanilla and sugars. Mix well and scrape the sides with a rubber spatula. Add half the dry mixture and mix until just incorporated. Add the egg and mix well. Add the remaining dry mixture and Rice Krispies and mix until dough just comes together. Press into the base of a non-stick 9x13 inch baking pan. Bake for 20-23 minutes, until barely golden on top, rotating halfway through. Remove from the oven and let cool completely on a wire rack. Meanwhile, make the ganache. Melt the chocolate in a heatproof bowl set over a saucepan of simmering water. Stir occasionally until smooth. Remove the bowl from the pan, set aside and let cool slightly. Meanwhile, warm the sour cream, in its container with the lid removed, in the microwave or in a bowl of warm water, until just warm. Stir the butter into the chocolate, then the sour cream, corn syrup, and vanilla, until well combined. It should be silky smooth. Let cool, stirring occasionally, until firm enough to spread. When the cookie is completely cool, spread the ganache evenly over the entire surface in soft swirls or stripes. Set aside to allow the ganache to firm, cut into 32 rectangles and serve. What a great idea to name the bar in honor of your friend! Hopefully, all the types of support for Rachel will contribute towards her full recovery. And the bar looks fabulous! What an incredibly sweet creation, and what an incredibly sweet thing to do. I wish Rachel a speedy recovery. This is one of the best things you have ever made!! I'm trying to eat healthier and yet I couldn't resist having 3 servings. So incredible. Everyone should try to make this! thanks, guys! and beth isn't kidding. i've never seen her so happy with something i made before! sheesh!